As hospitals and healthcare providers across the country know well, getting patients to pay their medical bills can be a challenge. As we discussed in a recent blog, studies show that healthcare facilities lose hundreds of millions of dollars in unpaid services, and many doctors cite this difficulty for the reason they gave up owning an independent practice. Epic River wants to help your facility find a solution. The Epic River Patient Lending program facilitates a partnership between your hospital and a local financial institution to offer your patients low-interest medical loans at no cost to you. The bank pays for the procedures or services you provide up front, and then they work with the patient on a repayment plan. As common wisdom would suggest, banks have a much better rate of success than healthcare providers when it comes to repayment. But the questions remains: why is it such a struggle in the first place? 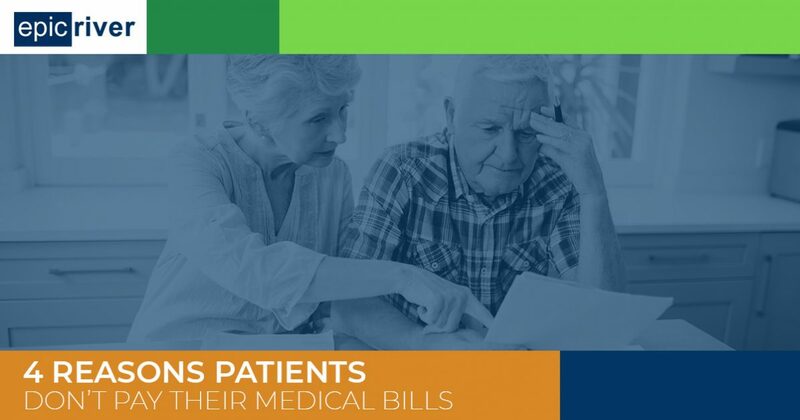 In today’s blog, we’ll discuss a few of the reasons why patients may not pay their medical bills, and how, as a provider, you can handle these blows to your bottom line. Continue reading to learn more, and contact Epic River today to learn how you can take advantage of our Patient Lending program. The first and most obvious reason why patients avoid their medical bills is because they simply can’t afford to pay them. According to 2017 government data, almost 50% of Americans under the age of 65 had annual deductibles ranging from $1,300 to $6,550, which still can leave thousands of dollars for patients to pay out of pocket (not including the coinsurance they likely have to pay past that cut-off). If patients have been dodging your billing department’s calls, it might be that they simply don’t have the funds to reimburse you for your service. Another possibility for why you aren’t receiving payments is because your patients are choosing to cover other important costs. If they have to choose between paying for rent or paying their medical bills, they are more likely to address the more immediate problem: rent. This may be why more than 40 million people in the U.S. have unpaid medical debts, according to a past study done by the Consumer Financial Protection Bureau. Data suggests that many people choose to delay or refuse medical treatment to save money — the same thought process likely applies to addressing medical debt as well. There are options out there for patients looking for a more manageable way to pay for their medical treatment. Loans are available from a number of sources. However, some loans come with serious and long-ranging consequences. When faced with predatory interest rates or bad terms, your patients may be choosing debt and avoidance as the lesser of two evils. Medical loans may be available, but they aren’t necessarily available to everyone. If approval for a loan depends on credit scores or citizenship, many patients may be immediately disqualified, losing access to a solution that would help both them and their providers. If a patient with bad credit does qualify for a loan, then they may be facing the poor terms we addressed above. They may decide that a bad situation can’t be made much worse by leaving further debt unpaid. As a healthcare provider, you took an oath to do no harm. How does that apply when the medical treatment you recommend can harm a patient financially or force them to make difficult decisions to try and stay afloat? The Epic River Patient Lending program can help you uphold your promise with low-interest loans for every patient, regardless of their creditworthiness. In fact, we make it easy, with simple online-based software and secure eSignature and document services. You can help your patients afford better medical care and get paid for your services. Contact Epic River today to get started!